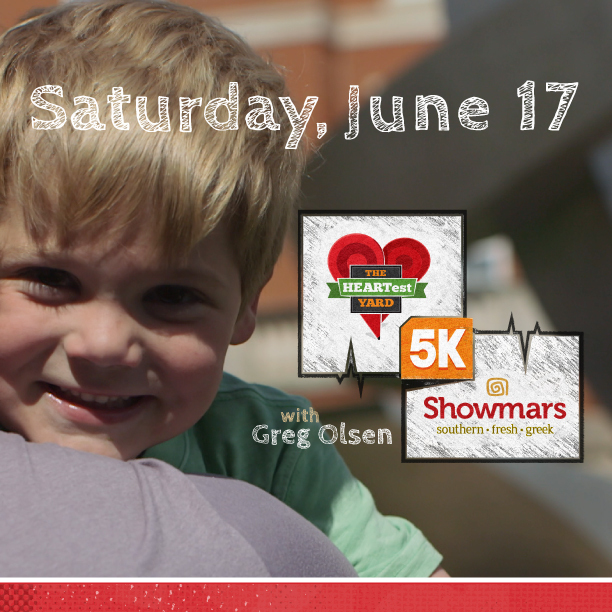 Receptions for Research: The Greg Olsen Foundation and Showmars Restaurants join forces for the second annual 5K to benefit families of babies with congenital heart disease born at Levine Children’s Hospital. The race is scheduled for Saturday, June 17 beginning at 8 a.m. Pre-race activities kick off at CMC Myers Park and from there, Greg Olsen and his family will lead a parade to the race start line on Cumberland Avenue. The race ends on South Kings Drive at Levine Children’s Hospital with a post-race celebration, including a children’s fun run, refreshments and family entertainment. The race costs $30 per participant, and the proceeds will support patients at Levine Children’s Hospital affected by a congenital heart defects. The HEARTest Yard is a program under the Receptions for Research: The Greg Olsen Foundation established in collaboration with Levine Children’s Hospital that provides no-charge medical support services to the families of babies born with congenital heart disease. Services include in-home, private nursing care, physical and speech therapy, and other benefits that serve as a complimentary extension of traditional hospital care. The program provides these services in an effort to reduce the mortality rate, increase the life expectancy and improve the quality of life for children born with heart disease. Media Contact: Kristen McCullough at [email protected].